One cannot merely imitate the old, but he can use what is good and eternal. Racialist Pagans rightly essentialize the racial being of their forebears in the context of the metaphysical-psycho-spiritual character of what was their inner religious life – not them as having been dogmatic believers of a religion-in-time. Racialist self-styled “Pagans” justly have Blood inheritance rights to claim Paganism as their racial heritage; no forebears = no Paganism. The spiritual existence of our European Pagan forebears was naturally intrinsically tied to their racial being as biological organisms. 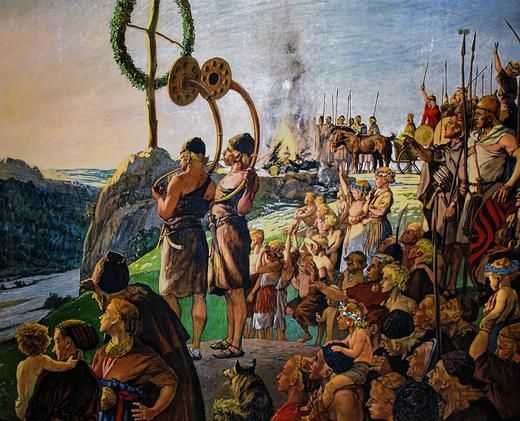 In the search for a new spiritual link with the past, there are those among the present day movement for renewal in Germany who wish to go back to the Edda and the cycle of Germanic ideas related to it. It is thanks to them that, alongside that which is purely fabulous, the inner richness of our sagas and folkish tales has again become visible from under the rubble and ashes left by the fires of the stake. But, in pursuing this longing to find inner substance with past generations and their religious allegories, the German faith overlooks that Wotan (Wodan, Odin) is dead as a religious form. He did not die at the hands of Bonifacius, but of himself. He completed the decline of the gods during a mythological epoch, a time of serene nature. His fall was already foreseen in the Nordic poems, although hopes were expressed for the coming of the strong one from above, in presentiment of the unavoidable twilight of the gods. In place of this, however, to the misfortune of Europe, the Syrian Jehovah appeared in the shape of his representative: the Etruscan Roman pope. Odin was and is dead; but the German mystic discovered the strong one from above in his own soul. The Valhalla of the gods descended from misty infinity into the breasts of men. The discovery and preaching of the indestructible freedom of soul was an act of salvation which has protected us up to the present against all attempts at strangulation. Racialist Pagans don’t justify their spiritual aesthetics by claiming dogmatic knowledge of dead faiths, but by knowledge of race’s importance. The nature & character of our pre-christian beliefs & spiritual experiences were necessarily molded by our then- collective biological state of being; this is what makes them of value and significance – and worthy of study and admiration. We can seek to learn about aspects of our collective psyche. [For an investigation of Wotan’s character] we must go back to the age of myths, which did not explain everything in terms of man and his limited capacities, but sought the deeper cause in the psyche and its autonomous powers. Man’s earliest intuitions personified these powers as gods and described them in the myths with great care and circumstantiality according to their various characters. This could be done the more readily on account of the firmly established primordial types or images which are innate in the unconscious of many races and exercise a direct influence upon them. Because the behavior of a race takes on its specific character from its underlying images, we can speak of an archetype “Wotan*.” As an autonomous psychic factor, Wotan produces effects in the collective life of a people and thereby reveals his own nature. For Wotan has a peculiar biology of his own, quite apart from the nature of man. It is only from time to time that individuals fall under the irresistible influence of this unconscious factor. When it is quiescent, one is no more aware of the archetype Wotan than of a latent epilepsy. I sometimes identify as Pagan not because I dogmatically subscribe to the worldview(s) of my forebears, but because spiritually I most identify with, and find inspiration in, the romanticized thought of folkish tribes of racially-White Europeans living in a semi-unbridled state of Nature [both internally (mental) and externally (environmental)] and creating their own values. Völkisch Paganism is run by a millennial White male and nature mystic. He has cultivated for himself a modern Pennsylvania Dutch blood and soil folkish identity based on his ethnic heredity, nearly three centuries of familial rootedness in Pennsylvania, and a romantic admiration for the remnants of pre-industrial, agricultural Germanic folklife on American soil in that state. In addition to the beauty of Pennsylvania German folk art, the architectural aesthetic of the rural landscape within the Pennsylvania Dutch Country evokes within him strong feelings of folkish spirituality and racial feeling. This entry was posted in Uncategorized and tagged heathen, heathendom, heathenism, heathenry, heathens, pagan, pagandom, paganism, pagans on 01/19/2017 by Völkisch Pagan. Apart from the conspicuous presence of feminists, anarchists, marxists, jews, people of “color” (brown? ), homosexuals, “genderqueers”, trannies, and self-hating, White, beta male cucks amongst them, the thing that is most amusing about so-called anti-racist Heathens is the inherent hypocrisy of their comments on our pre-christian forebears in relation to the issues of racialism and politics. Anti-racists (read: anti-Whites) will scream at the top of their lungs that our Pagan ancestors “were not racist!”, doing so in such a way as to give the impression that they surely must have been staunchly racially egalitarian, pro-multiracialism, and that not only did they have no beliefs or collective tendencies which would suggest they would have opposed race-mixing, but they would even likely have considered such a position shameful, dishonorable, immoral, and unkind. Before going any further, let it just be stated that the so-called Wicca movement is made up mostly of feminists (including any “men”) who hate men along with universalist “Pagans” who bash christians while trying to outdo them in their attempts at signaling universal moral righteousness. They have merely secularized the judaic slave morality found within judeo-christinsanity. In reality they are nothing but a bunch of secular christians who have turned “God” into a woman, replaced misogyny with misandry, and who adhere to a modern “progressive” morality and worldview. Without even being aware of it, much of the founding for the historical perspective of the anti-racist “Pagan” is tainted by modern and contemporary jewish myths (read: lies) emanating from (((academia))) and its fringes. We have all been handed both a misleading view of the history of mankind and a wholly false understanding of his Nature. [※See the end of this post for a plethora of purveyors of social justice parasitism on the White-European peoples of the planet.] As a result, these people are very often dogmatic when it comes to imposing an anti-Nature and subversive, modern morality onto our forebears. Anti-racist “Heathens” have a notably egalitarian, i.e. judeo-christian, universalist morality and conception of good and evil. When they speak of racialism and anti-jewish sentiment they sound like christians neurotically seeking to instill in others the impression that their ways are sinful and that their fate shall be cruel lest they repent and atone. It is funny (yet sad) and truly ironic that so-called witches and Heathens are now taking on the role of the christian in their attempts to burn us at the stake of public moral opinion. Let us not be reactionary and delude ourselves into believing that we are able to be exactly as our predecessors were, i.e., come to imagine that we are capable of experiencing being in no way different than they themselves, in the sense of how they interpreted and perceived their existence. Our own lives will be unique, adapted to the reality of our current collective circumstances, and not identical to the situations we faced thousands of years ago. Naturally, we must adapt to our present existential truth as it pertains to our race’s future life. As a race, as a people, we must deal with today’s conditions, just as they undoubtedly would have done. Another point of incoherence coming from anti-White persons calling themselves Heathen or Pagan is the notion that there is a rational argument to be made that racialist Pagans are not real Pagans because they have an interest in politics. Everything is political at the collective level. Our forebears certainly were not apolitical. The political landscape and realities were surely different, but apoliticalness is collective impotency. They would have defended their interests as a people. The notion that these cultural marxists better represent our ancestors’ worldview is completely absurd, since if they were listened to we would eventually go extinct. A lot of this is just common sense; or, should be, and most assuredly once was. It really is simple logic. Also, how do they explain the hypocrisy of their charge that Pagans who mix racialism with Paganism are abusing Paganism, and misusing it as a cover for politics, when they themselves have organizations such as “Heathens Against Hate” and “Heathens United Against Racism”? Are they themselves somehow not political, also? Apart from appeals to the Rigsthula or Tacitus, not many racialist Pagans actively claim that they find explicit justification for their racialism in the myths, or recorded pre-christian European history, or any such thing. The reason is because they do not need to, and so, this is yet another point of illogic on the part of these so-called Heathens. They always feel the need to state that Pagans who adhere to racialism do not represent authentic Heathendom, as if somehow their opposition to it makes them more qualified representatives. Again, very few racialist Pagans claim they find explicit justification for racialism in the myth, rather they simply use reason, natural instinct, and common sense in their affirmation of its righteousness and just cause. It is not a coincidence that many racialists gravitate toward our ancestral ways. We do not use Paganism to justify our racialism, we use racialism to justify our Paganism. 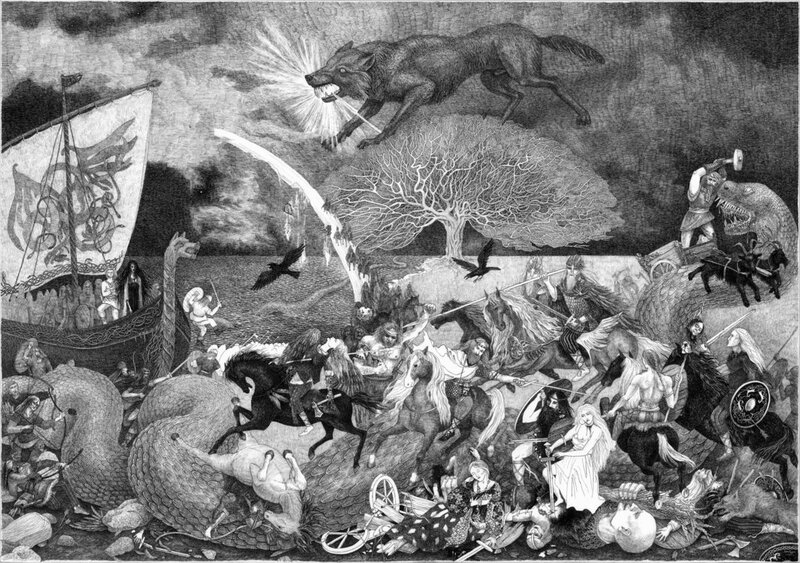 If, based on the belief that there is no explicit mention of or dictate on race in the Lore, racialist Pagans are abusing and misusing their ancestors’ Pagan myths, symbolism, and imagery simply by being racial, then by that same line of reasoning so too are anti-racist Pagans abusing and misusing these myths and aesthetics by being so aggressively anti-racial. Lastly, our pre-christian kin of days long past did not practice a dogmatic faith where their religion was separate from their everyday lives. It was not unchanging, and its intended function was to advance and improve the collective life of the folk, not hinder it. Did they even have names for their particular all-encompassing spiritual world conceptions, or did they just have terms to describe merely some of their beliefs and practices? Were not various forms of their religion and spirituality expressed differently according to European region and place in time? If a clan member were to stop believing in certain things, would they no longer be treated as kindred peoples, or would they still be seen as kinfolk? Regardless, we see no commandment to race-mix, to remain apolitical, to not defend our racial inheritance, to be submissive, suicidal beta males, nor to be so anti-Nature as to consider our ancestors’ biological truths to be of arbitrary significance. We are them. They are us. We are our Pagan forebears, and in the most literal and meaningful sense, for if our Blood becomes mixed there shall be no return to the state of being which produced Paganism to begin with, but so long as the Blood remains relatively pure there remains hope and the potential that future offspring – even those of the most degenerate members of our race alive at present – will one day achieve individuation in conjunction with Nature-derived enlightenment accorded them by whatever the divine force is which animates the cosmos. “Óðinn actually sends Heimdallr to Earth to create a better human race. His first attempt is called Trell (Thrall), but he is black, ugly and stupid, so Heimdallr pays no attention to him and keeps trying. The next result is Karl (Free Man), who had red-brown hair, is tall and strong. He is still not satisfied though, so he keeps trying. Then finally he gets a son called Jarl (Proto-Norse *EirilaR, English Earl), that is fair-eyed, intelligent, beautiful and fair (European). Heimdallr had finally created a man who is good enough for Óðinn and Valhalla, so he teaches him – and only him – the runes (secrets) of the gods and Valhalla is opened up to his kin. His kin is the only one that will be let over the bridge that leads to Ásgarðr (“the court of the Æsir” or “the yard of the Æsir”). The others will ignite and fall down like rocks if they set their foot on this bridge, that is guarded by Heimdallr. To enter at all you need to be of Jarl’s kin and be innocent and not bring anything impure, but to be able to leave again after visiting you need to be alive too. Naturally it doesn’t really matter what you say as the guardian of the bridge already knows all the answers (he is after all Heimdallr, the white god or “Santa Claus” if You like, who knows everything there is to know about his children already), but if You try to lie to him You will certainly be surprised by what happens (just ask King Arthur and his knights…). As we know, only the good children get presents from “Santa Claus” on the Yule Eve, and the rest get their stockings filled with ashes (and that ashes is all that is left of other “bad” children who tried to cross the rainbow bridge) from the chimney. Worry not, European persons, your forebears would have been totally okay with this. “Through the racial question alone, i.e. through the eternal laws of blood, of type, of nature, we can understand life and history. The results of the inquiries of natural science in the field of racial science disprove the fundamental concepts of the past. The Folkish Movement is the first political consequence of the more recent findings of science. National-Socialism deliberately places race at the center of political thought. Blood and Soil are the two most important foundations of life. “Blood” and”soil” are however not material, but the highest ideals. As our Germanic forerunners already recognized, blood and soil are eternal and holy values. For eternal is the bloodline which manifests itself from the past through the present into the most distant future. And eternal too is the soil, hallowed by the blood poured forth in its defense. These highest core-values place a great obligation upon us: remember that you are a progenitor! [We] can turn to the primary fact of [our] own material existence and see the organic truth that [we are individuals] spawn from a collectivity, one link in a racial chain extending back into the past. “The idea of metagenetics may be threatening to many who have been taught that there are no differences between the branches of humanity. But in reflecting, it is plain that metagenetics is in keeping with the most modern ways of seeing the world. A holistic view of the human entity requires that mind, matter, and spirit are not separate things but represent a spectrum or continuum. It should not be surprising, then, that genetics is seen as a factor in spiritual or psychic matters. And the ideas put forth by those who see consciousness as a product of chemistry fit into metagenetics as well – for biochemistry is a function of organic structure which in turn depends upon our biological heritage. ***The original Latin term is rutilae comae, which Google translates literally as red hair. It can be seen rendered, in yet more translations of Germania – which was originally titled On the Origin and Situation of the Germanic Peoples – as red-blond, reddish yellow, and golden red. It is also helpful to be aware of the following jews and the ways in which their work is utilized by other jews in the process of constructing subversive historical narratives about the modern world: Maimonides, Baruch Spinoza, Moses Mendelssohn, Emile Durkheim, Georg Simmel, and again Albert Einstein. Not to mention all of the unnamed pernicious and subversive chosen ones one finds in historical and contemporary finance, the corporate world, bench and bar, politics at all levels including theory and activism (in particular re: Marxism and feminism / gender theory), all forms of media, and what has become of the arts. One has to genuinely wonder how many jews have been able to subvert their host populations without ever being identified as jewish. This entry was posted in Uncategorized and tagged heathen, heathendom, heathenism, heathenry, heathens, pagan, pagandom, paganism, pagans on 08/27/2015 by Völkisch Pagan.